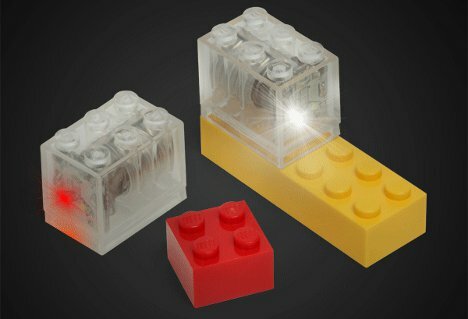 They are many times more expensive than regular LEGO bricks at $10/pair, but think of how much more authentic your airplanes, alien spacecraft and emergency vehicles will be with real flashing lights! They come in red/white, blue/white and green/white and the embedded LEDs last for 100 hours of flashing. But since they only flash when tapped, they can last virtually forever. See more in Gaming & Geek or under Gadgets. September, 2012.